This is another one I keep seeing around. Good morning, Leela. Congratulations on another successful orbit around the sun. Here's a birthday shout out to you from down the coast. Thank you for this tutorial. I'm working on a larger piece that is almost 70% in deep shadow. With a little help from you and Mr. Rembrandt, I might turn it into something good. But haven't you heard? Shadows are always cool, light sources are always warm (except when they're not)! You kids and your realistic reflected light and your amazing Wyeths and your funny hats. Seriously though, this addresses one of the most prevalent myths about colour. And it's a well-explained tutorial, and I'm glad it also gives an example of another mistake you can make. Super good tutorial. You do such beautiful work! Thank you for sharing your expertise with us, as well! Deviantart and I desperately needed this, thank you! I like the top one better. Just from looks. I understand it's not as realistic. Great insight. And great illustration to go with it. Thank you, this is beautiful! I always forget secondary lighting. thx for sharing this very helpful thought ! This is wonderful! You're a color guru! Thanks for studies like this. Light and colour can be incredibly tricky, and I love to learn little things and stuff like that, so thanks for the nice tutorials! very helpful and illuminating! thank you! this looks so impressionistic and awesome and I enjoy this. I have fallen into this trap myself, because being lazy is easier. But I shan't ignore the logic of light-source again! Toerning, you are a real expert on painting light! What books, links, or professors would you credit for helping you research the effects of light on life? Well, personally I learned from observation and curiosity, I think those are the most helpful tools. NC Wyeth and Sargent's non-portrait works were very instrumental in helping me recognize those effects in nature. Thank you, toerning! This means very much to me. Haha this is awesome, thanks for posting things like this! This is a really nice tutorial. And a good spot with the random blues. I tend to use light and reflection, refraction and deflection etc for it'e eye catching and eye guiding abilities and influencing mood / theme. I stay away from overly realistic lighting (because I can in a drawing) but confuse the eye into doing what I want. You're great at doing that yourself. I've been an admirer of your painting for a while now. And I can definitely see Wyeth's influence on your work. Very nice indeed. Gratias! This helps a lot. Guilty as charged. Fact is, that blue (or orange) light just works so well for cheaply emphasizing volumes, especially in cheesy, dark fantasy pictures where realism be damned. But I'm more fond of drawing things that make sense (even if not 100% realistic), so I really appreciate this. It's actually amazing how much brightly coloured clothing DOES reflect off skin for instance, and you hardly ever see that in art. One day I was walking around specifically looking for reflected light and it struck me how much of it there is in real life, especially in warm summer days. We're just somehow really good at ignoring it *pets light* It's ok, I like you! Thank you! Really informative thing. Great tips! Thanks! Also, loved the links. Amazing paintings. thank you so much. it's hard to get the hang of it at first, but once you do, you'll really rock with colors. Yeah, what is it with all that blue reflected light out there?! I don't understand the appeal. Wonderful! I've often seen work that I thought was over done with reflected blue and its made me avoided doing it in my own work. 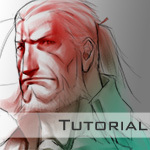 Its brilliant to see a tutorial on how it should really be done. Yes to this, and yes to Wyeth! Definitely something I wish artists kept in mind more often.